The owl was very hungrey.so we gave it some chicken cat food. The brown stain on her front is the gravy from the food.. She is sitting on my shoulder for this feast. 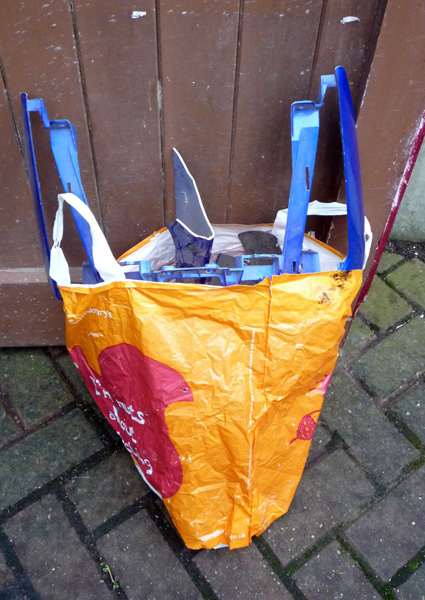 It had been a wet damp day and with it getting dark at about four I had decided to shut the workshop early as we were up to date with work and had no bookings for people to drop or collect. It came as a shock to find an owl sitting on the fence looking at me as I came out of the door. He/she just sat there, then opened his wings and took off heading towards me I ducked and as I did he landed on my back Wow! I moved back to upright slowly and as I did he walked up my back until he was on my shoulder. Jac was standing beside me when this happened she could not believe what she had just witnessed not only that but the owl allowed her to stroke him, while she was doing this she managed to get the number of the ring he was wearing and the web address, to cut a long story short we ended up at www.ring.ac which tracks ringed birds across the country. We emailed them and waited for an answer. But what now? I moved my hand up to stroke the owl and as I did, it gently pecked at my hand so we decided to find it something to eat. It had started to rain so I moved back in to the workshop with the owl still on my shoulder and waited for Jac to come back with some food. Once he got the hang of it he tucked into a bit of real chicken pieces cat food. When he had decided he had had enough he flew off my shoulder on to a ladder that was standing at the back of the workshop, he looked quite happy so we put a bowl of water down locked the workshop and waited for some info. The following day some info started to come in. It turns out he travelled from Thetford, Suffolk. Quite a way! He was spotted a couple of weeks earlier by another local in the area. At around about midday Weirfeild wildlife Hospital in Lincoln ( www.weirfield.co.uk ) came to pick the owl up. We were informed he had been let back into the wild from captivity but had not gone back to complete wildness. It was a great experience and a shame to see him go. You never know he may return when they let him loose again. A short rest to let my dinner go down. Just recently the BTO sent us information on the Barn owl that we had to visit. For starters he is a she, Jac felt he was a she at time.She was very gently with us except when she court my hand with her claw. It was only a light touch but cut my finger quit badly. The man from Weirfield Hospital said you need to be very carefull of their feet. That is why falconer ware gloves. She is a young bird at three years plus. We do not know if she has been re-released back into the wild one day we may come out of the workshop, to find her sitting on the fence looking down at us. While on the subject of wild life, this year so far has been quite good for spotting rare birds, I say rare because I’m not a bird watcher looking to spot fowl. On several occasions whilst walking the fat controller (our border trolley) we have seen a white heron in the small stream between the houses. A first ever for me and the area. To add to that on two occasion in the same place we have seen a kingfisher’s sudden flash of blue as it disappears up the stream into the distance. IT seems that you are not. We had a gent in the Monday before the start of TT week. He had his Ducatti re-sprayed ready for the trip. 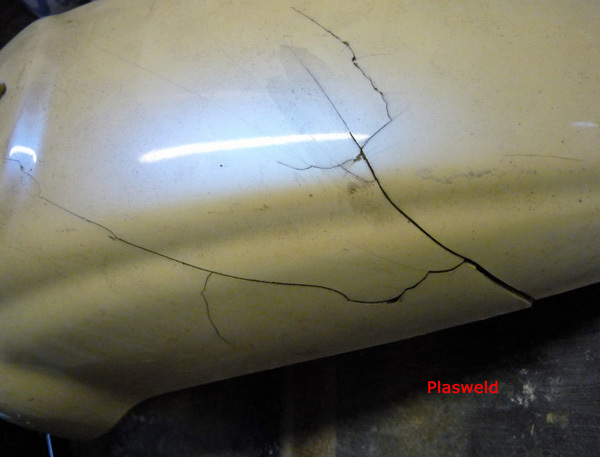 Some cracks had appeared in the plastic that the sprayer said had been plastic welded. The spray job was great but there was a problem with the so called plastic welding. It was a bit of filler and fiber glass smeared across the back for support hence it had re-cracked, no surprise there! Just recently another customer was almost suckered by a spray shop saying they could plastic weld. When they started talking about reinforcing the back to stop it cracking further, he decided not to go back because he lost trust in them. He felt they did not know what they were doing. 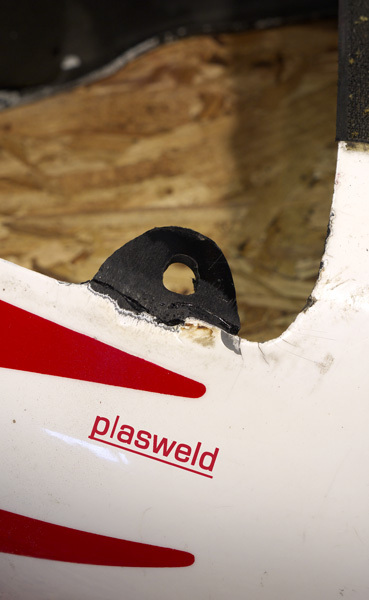 Plastic welding has been around for a long time. It is recognised by insurance companies as a proper repair meeting their very high standards. It is also part of the NVQ, SNVQ, National diploma, Higher National diploma and Foundation degree for motor vehicle engineering and yet some repair shops still bodge repairs; there is no call for it; this is part of the reason we do not spray, you can see we have given you the ‘real deal’! We have seen over the years repairs using super glue, rivets with metal support, soldering iron and super glue, filler and fiberglass and wire ties. All valid temporary repairs by the DIYer but have no place in the professional workshop. If you are paying large amount of money for a repair you should expect the best, it’s not always a good idea to go to a one stop shop; once the paint is on you do not know what you have paid for. It may be a great finish but will it be let down by the foundation crumbling. The year has hardly started and we have had our first odd ball repair. These are repairs that we just do not expect to see. It also happens to be the second smallest item we have had to deal with. The smallest was a hair/beard trimmer. Anyway whats this mystery part? Do you think I’ve built up the suspense enough? It is the filter housing from a small clark air compressor some how the threaded end had broken away from the main body. It was a quick job to do, made from a good gauge of material.